I revisited my Pardelote linocut and redid it as a larger woodcut. Really happy with how it worked out, now I have more idea of how this medium works. I was able to add more detail into the background while still keeping the simplicity of the composition. It was much harder to cut in wood and I had trouble with bits chipping off, though super glue helped to save his leg! I will be adding colour to some of the prints, but I have such a busy month it may not be till September. Here is the original drawing and the first print just for comparison. This time I remembered to flip the design before transferring it onto the block. See learning has occured. I have started my second printmaking course, this one is where I get to learn how to use the studio and print my own work. Once I have completed this course I will be able to use the studio and print my work when ever I want. 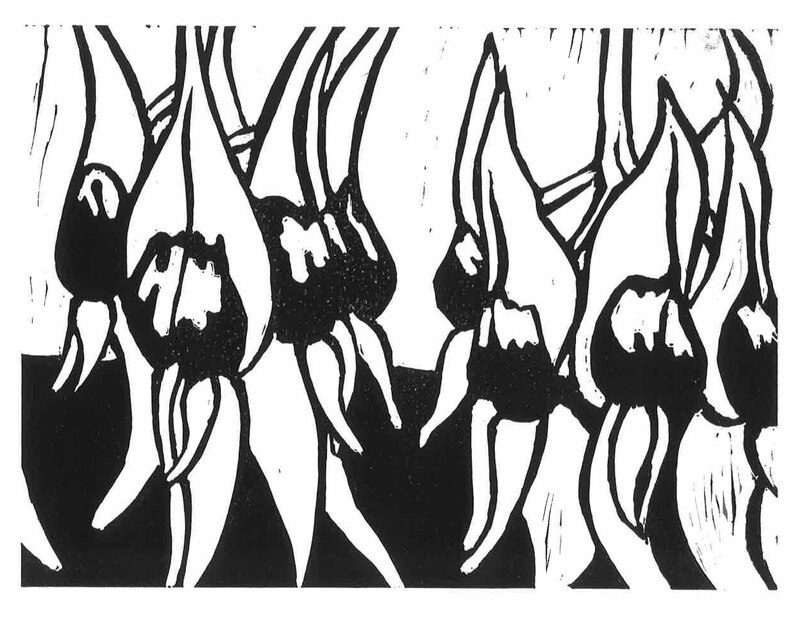 I made this lino a few weeks ago on holidays, see the other Desert Pea post. It is large of course, I don’t often do small works. It was fairly difficult to get to print well, but I am pleased with it as it is only my third attempt at printing. 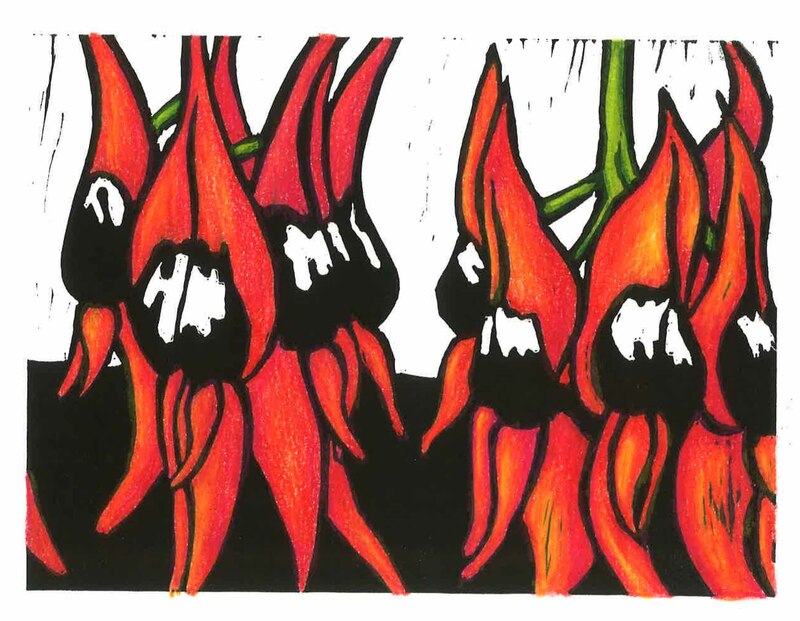 It has been taken from a drawing I did in 2012 Sturt Desert Pea 2, this is one of my favorite works and I wanted to reuse the image again in a different medium and push it a bit further. The image has been flipped in the printing process. I, of course, will be colouring in some of the prints and I am going to experiment with printing it on different papers and coloured backgrounds, so you will see this image in a number of different guises. Although this print looks rather clean, I was far from it, some how in the course of the 2 .5 hours it took to print this lino, I manage to cover myself in ink. As my hands were covered I unconsciously touched my face (a lot of times) and had been running around the studio with an almost black face. My fellow students were most kind and didn’t laugh at me and only mentioned I had ink on my nose. When I looked in the mirror I couldn’t stop laughing, it really was covered. Lucky I checked before I walked out! 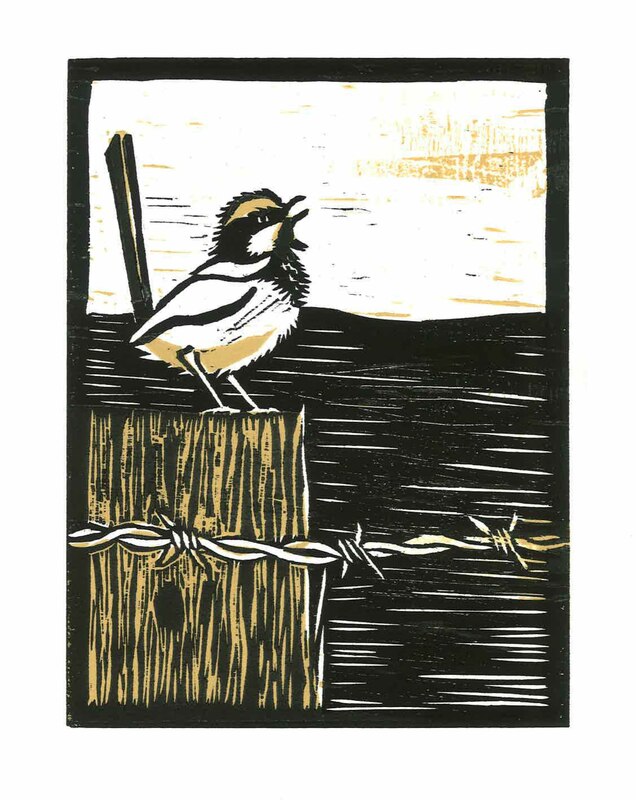 This is my first ever woodcut, a little blue wren, sitting on an old fence post singing his heart out in the morning sun. There was a family of blue wrens that lived on our property and spent the day ruffling through the gardens looking for tasty treats to eat. They would come and watch you garden and sing and cheep away, such lovely companions. This is the last print I did for my first relief printing class and it was a two colour wood cut. This time instead of reduction we did a two plate print. Again we had no choice in the second colour so not the colour I would have chosen. But I see this as a draft for the second lot of prints that I am currently working on. 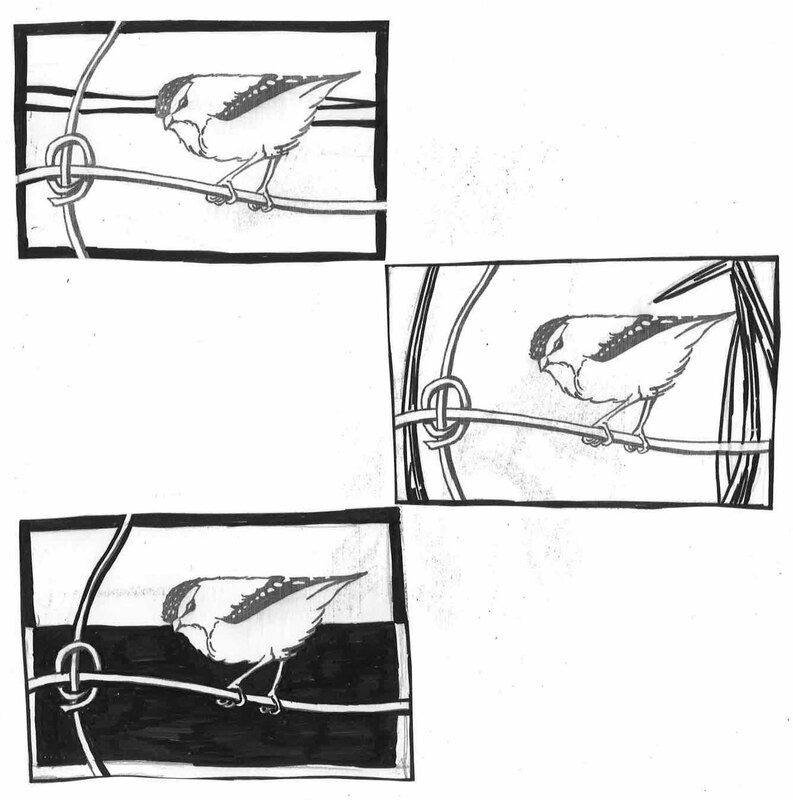 A short series of the birds that used to visit us on the property I used to live on in Castlemaine. I enjoyed using the wood and really liked how the texture worked on the stump. Lots to think about in how to use the grain of the wood in future work. The wood also smells better than the lino. 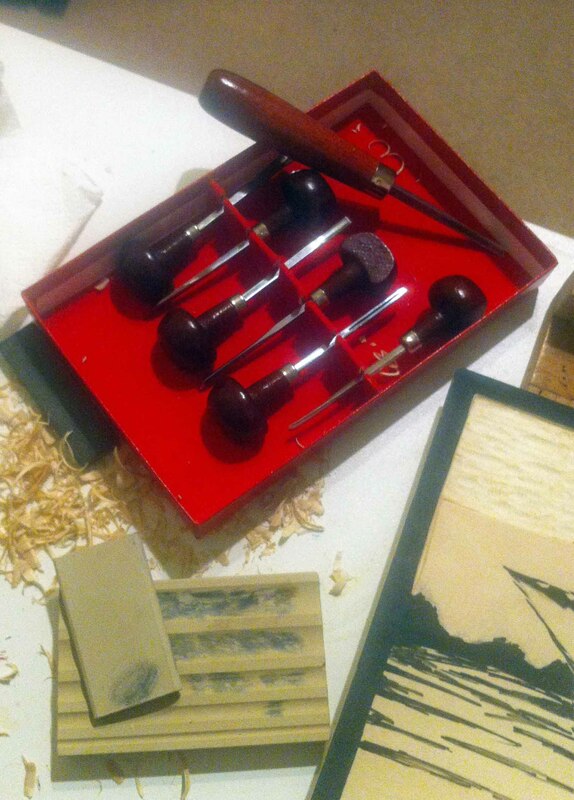 I am have been getting together my tools for my next printmaking course. This one is more about working in the studio at Australian Print Workshop. When I complete this course I will be able to go in and use the workshop whenever I want. It is like getting my studio license. I will need to have all I need to do the printing so I have been having fun getting new art supplies. It is a tough job, but someone has to do it. 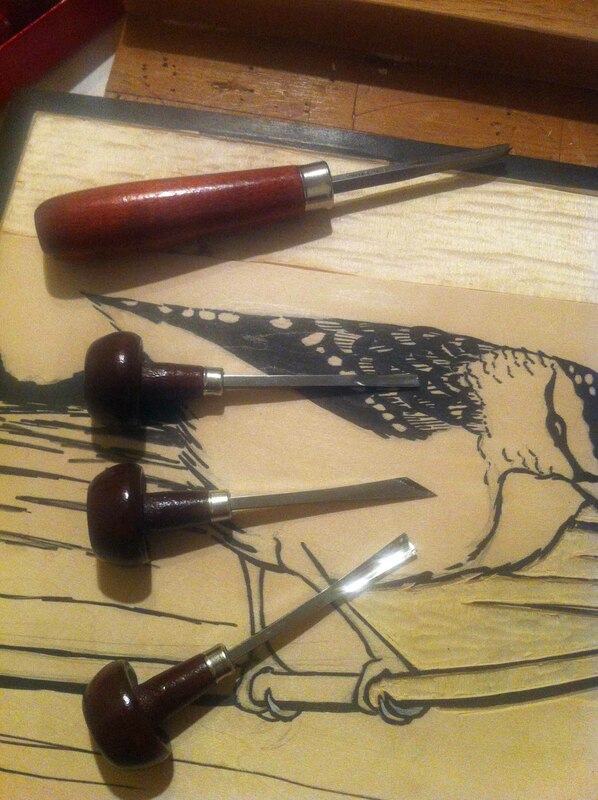 I have bought some beautiful lino/wood carving tools. I decided to spend a little more and get some decent tools that will hold their edge and feel good. Then of course I had to buy some sharpening stones to keep the edges sharp. Still trying to get the knack of a really sharp edge (any suggestions or tool sharpening tips greatly appreciated). I decided to redo the bird prints that I did previously on a larger scale with the right colours this time. So I have wood shavings flying and some sore fingers, but very proud to say no blood as yet. The bench hook (board that I am carving on) is very special to me, it is my late fathers cedar drawing board which my cousin partner turned into a bench hook as it was no longer smooth enough to use for drawing. Thanks Chris, it is already in good use. Having so much fun, there is nothing like a new project. 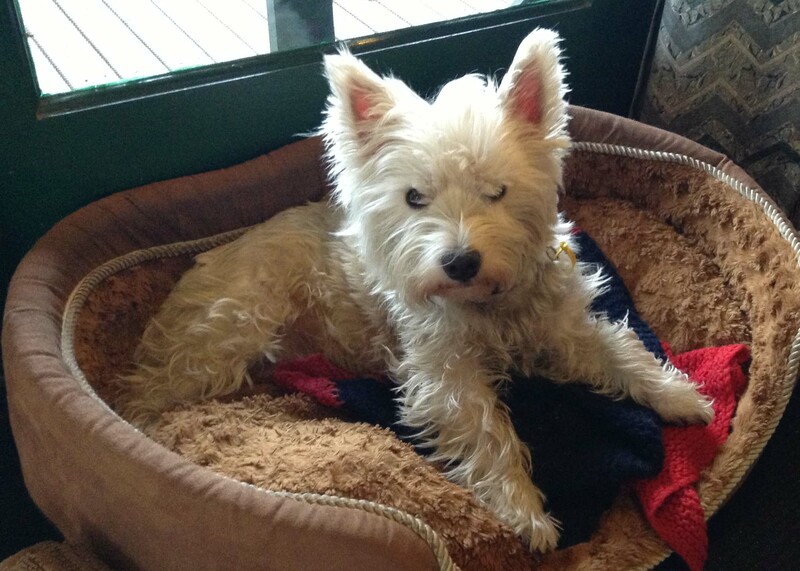 PS a special hello to all my friends in Paris at the moment, have fun, relax and partake in all that great cuisine. 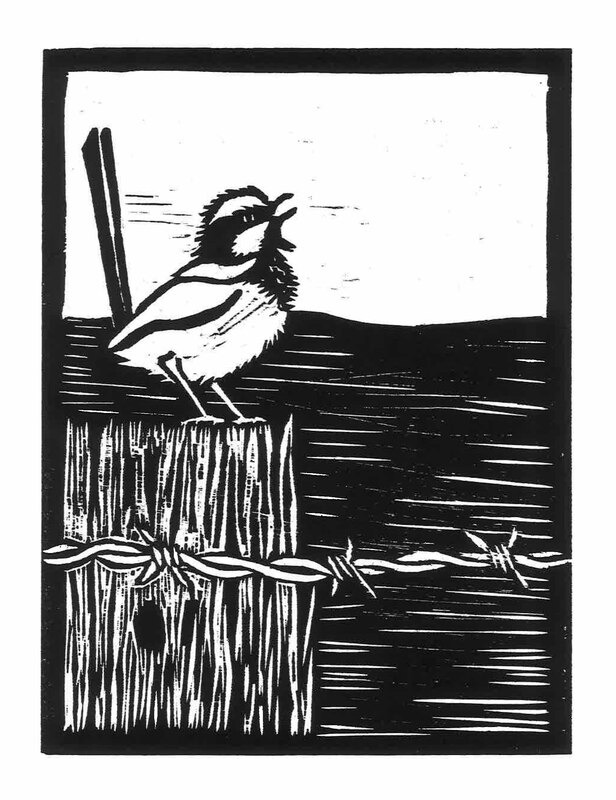 Here is my second linocut. It is a Spotted Pardelote, which is a tiny finch like bird that used to nest in the banks on our property near Castlemaine. They are lovely little birds. The colours are not right, but as this is only a practice piece while learning the techniques we didn’t have a choice of colour. This is what is called a reduction print. You carve out all the areas that you want to leave white (or the colour of the paper) then print with your next colour, in this case red. Then you carve out the areas that you want red and print with your next colour, in this case black. You can keep printing as many colours you like, but two was enough for our experiment. I was really happy with how the bird turned out and can’t wait to do another one of this image with the right colouring. 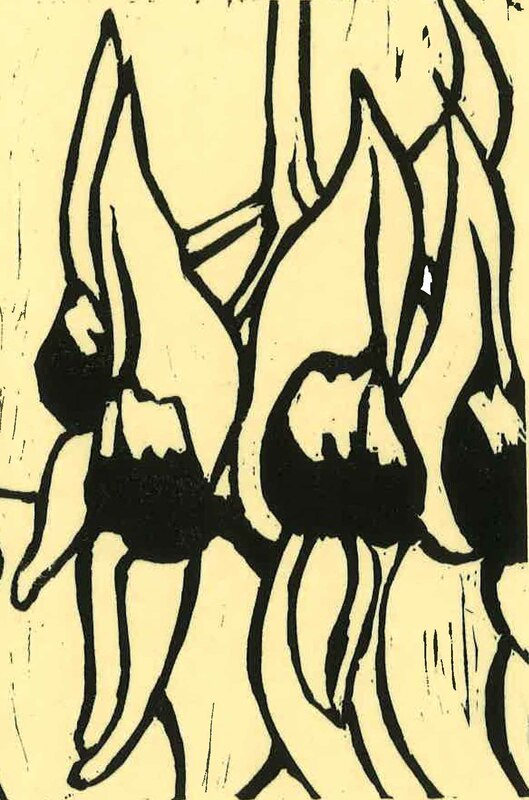 I think a woodcut. 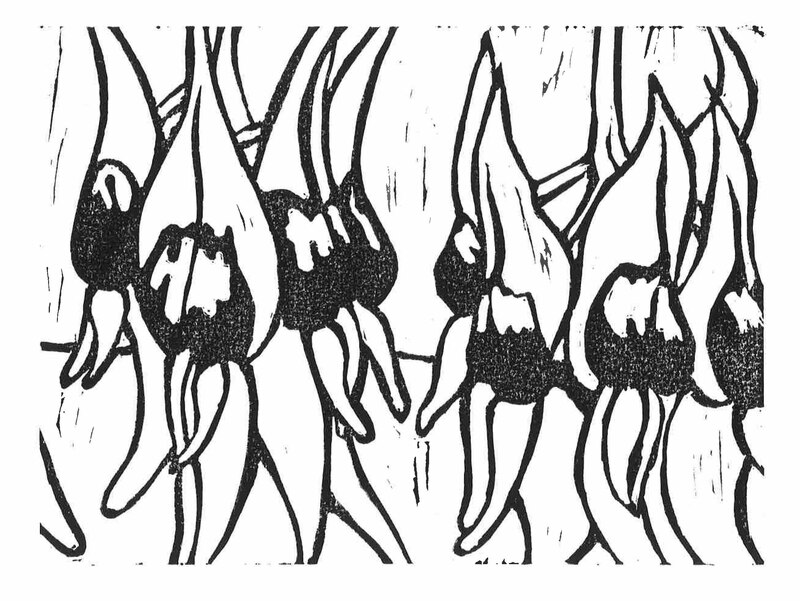 I have printed my Desert Pea Lino cut. 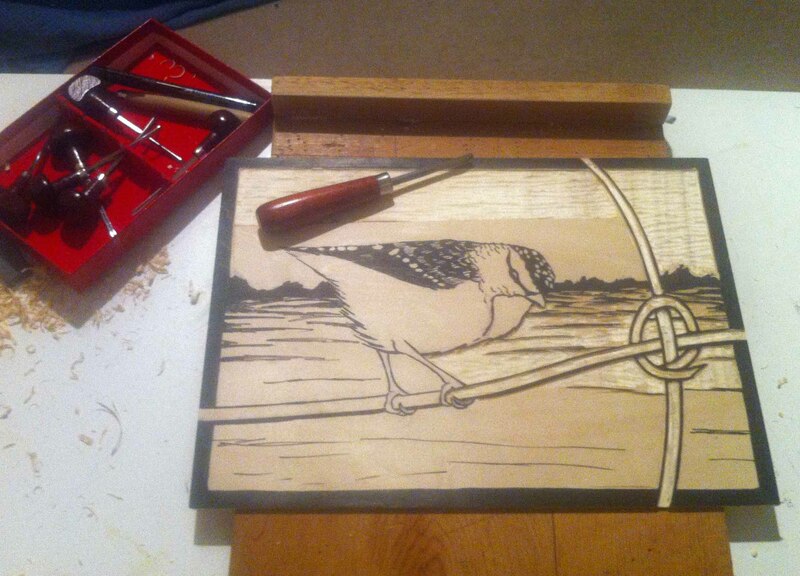 Very happy with my first lino cut in more than 20 years. This was a single colour print in black, printed on a press and I have hand coloured this one with coloured pencils. Of course! The press we printed it one was really lovely, a 1860s, huge wrought iron number with great big levers and gorgeous scroll work. They don’t make them like that any more. Here is an uncoloured one. I went back and carved out the background for the next ones, for a bit of a different look. This one is hand printed so the colour is not so intense and the background has been carved out. Again this was hand printed, but onto Japanese rice paper and the printed is much darker. This I really love and will doing more of. (The image is chopped off because I scanned it around the wrong way!! !, but you get the idea). I am currently on a little holiday for a quick week off work while I have a moment in a very busy year. Sitting at Deans March (behind Lorne on the Great Ocean Road), stunning beaches and forest, that would be rain forest as it has been raining constantly for the last 24 hours. Still cosy inside my cottage with the wood fire, my little dog and new lino cutting tools and loads of lino and wood to cut. Great Big Happy sigh. I have started my relief printing course and have done the first two sessions. So much fun! It combines a whole stack of processes that I love and my style of art really lends itself to this medium. You get to draw, carve, print and colour in, plus you have prints to keep, sell and give away. Happy sigh. We started out with a single colour linocut on a very rubbery lino, which was easy to carve. 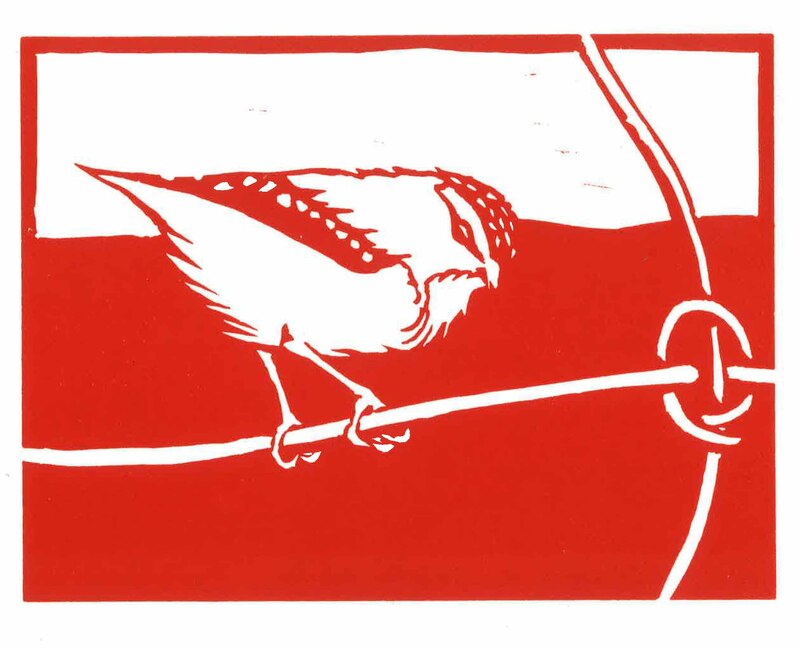 especially as I have memories of trying to carve old, tough lino at school. 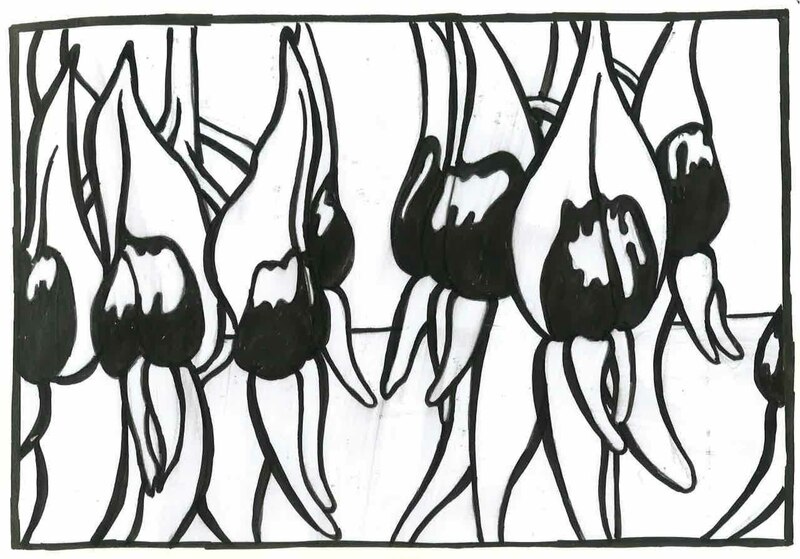 I used an image from a earlier drawing of the sturt desert peas, love recycling and trying images out in another way. 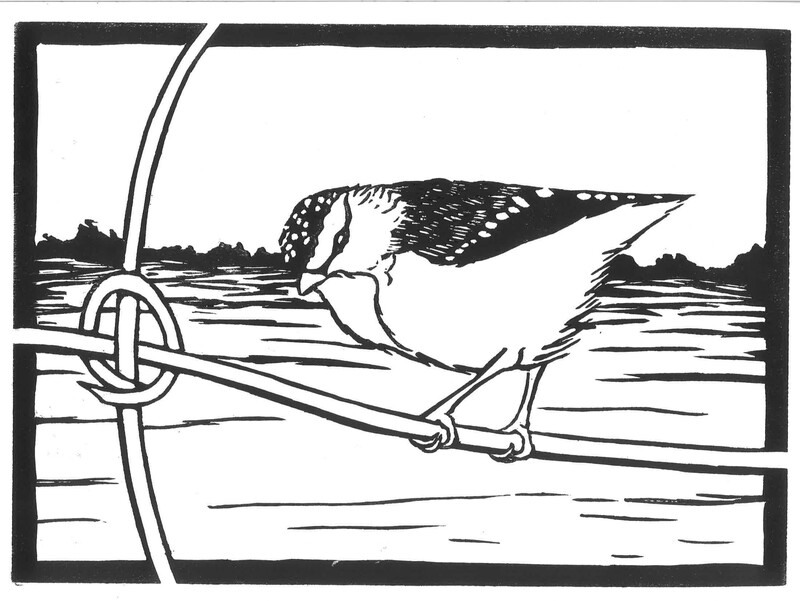 We did another lino print using proper lino and it will be a two colour reduction print. 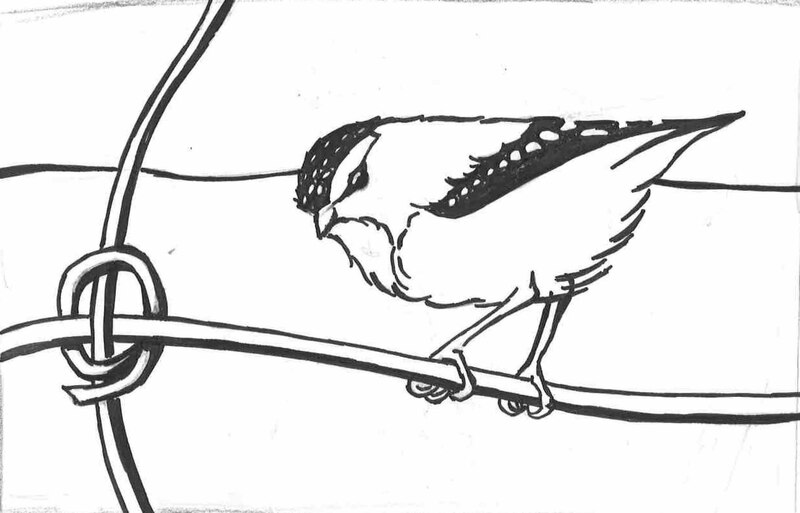 For this one a drew this lovely little pardelote, a tiny spotted bird that used to visit our property when I lived in Castlemaine. As my prints are still drying at school I have my drawing to share with you, next week I will have images of the actual print to share.